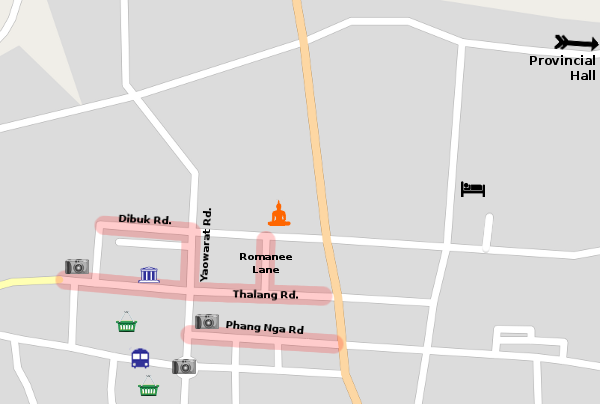 Highlighted streets are the main historical area. Click on the icons for more information. Phuket's old town area is easy to explore on foot, and it's small enough that you can't really go too far off course. It's the kind of place you can easily wander around in and not worry too much about getting lost. Start at the fountain traffic circle. If you come to the Old Town area from one of the other beaches by bus, then this is the easiest place to start, since the buses will let you off in front of the new fresh market just west of the fountain. From the fountain, head north up Yaowarat Road. If you walk up the west side of the road, with the buildings on your left, a short way up from the traffic circle you will see a narrow drive pierced through the old shophouses. If you walk up the passage - make sure a car isn't coming down it first - you'll be somewhat surprised to see a somewhat run-down old mansion, sitting in a fair sized lawn with a formal drive, all surrounded by the high walls of shophouses. Continue up Yaowarat Road to the next four-way intersection and turn right onto Thalang Road. This street is lined with well preserved shophouses, many houses traditional businesses such as printers or even auto repair. Very few have been converted to capture the tourist trade. Halfway up the street you will come to Romanee Lane on your left. This narrow alley is lined with well maintained shophouses, some of which have been turned into antique shops and pubs. At the end of Romanee Lane, turn right onto Dibuk Street. There isn't much to see at first, but just past the gas station are more buildings, the first of which was being restored by the Thai Hua foundation as another museum. Continuing on Dibuk past Yaowarat, the street is lined with more beautifully kept buildings. There are several restaurants and cafés along Dibuk Road, if you're feeling peckish. Dibuk Road ends at Satun Road. Turn left onto Satun and walk down to Krabi Road. The old Governor's Mansion is on the corner on your right as you reach Krabi Road. The Pithak Chinpracha house is right next to the Governor's Mansion on Krabi Road. If you go up Krabi Road to view the mansions, return back down the street towards Yaowarat Road. There are some more nice buildings along the street, and the Thai Hua Museum is on your left. After visiting the museum, it should be easy to find your way back to Yaowarat Road and the fountain where you started.